I'm becoming increasingly obsessed with candles. They're pretty. They smell amazing. And the jars they come in are lovely too. Cleaning the jars is remarkably easy and you're left with an item that will last for a very long time, whether you use it for candles again or for another purpose. 1. First of all, boil the kettle and fill up your jar with boiling water. The wax will melt and rise to the top. Leave the water and wax to cool. 2. Remove the wax layer from the top. You might have to break it up with a knife to get it out. If the wax is scented (and clean) it can be used again in a wax burner. 3. 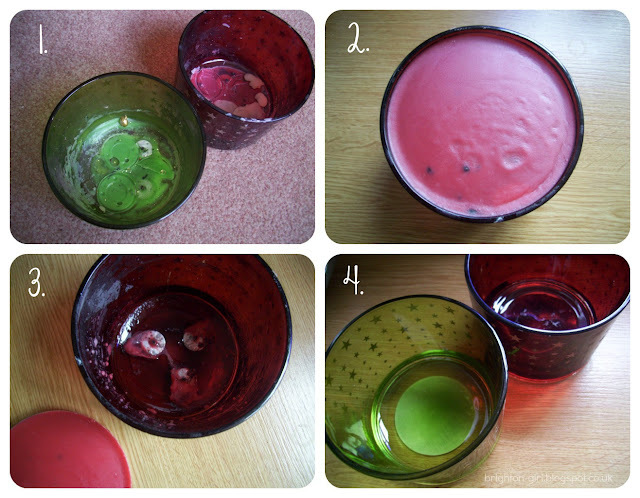 The hot water will have softened the glue that attaches the bottom of the wick to the glass. I use a knife, very gently, to give them a bit of a nudge and they soon come free. 4. There will be some residue of wax left, but you can remove it by washing the glass with washing up liquid and giving it a good scrub. (Be careful with some coloured glass holders, however, as sometimes the colour is actually a film that you might accidentally scratch off). That's it! It really is that easy! Your jar can now be used again and there are so many different options. Obviously, you can use it for another candle or make your own by buying candle wax and wicks. The jars also make great containers for the bathroom or bedroom. You could even use larger ones as a planter for spring flowers. If you don't want to use them youself, you can also donate them to your local charity shop as a decorative item. Hi! I found your blog through katieclarkemakeup.blogspot.com! I love this post! 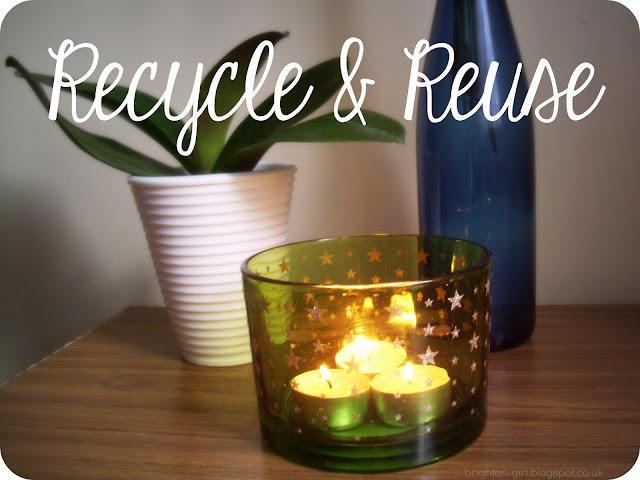 I've been doing the same (reusing candle jars), except I put mine in the fridge overnight and the wax just pops out with a little help of a butter knife :) I'm going to join this site! Normally I just throw them away :$.